1. I updated the crown gallery to show all 49 of the crowns I've put in the mail. It's a fun scroll, so check it out! The last crown I made came from my orange curtain fabric, and paired with blue bobble trim - it just made me so happy on many levels. 2. I'm anxiously awaiting Whip Up's new mini-mag, which I think could be a great homeschooling resource. It's loaded with crafts, cooking, and outdoor activities for kids, with busy parents in mind. It sounds lovely, and it will be available to download on March 1. Don't forget to get yours. 3. I've added one more little thing to my crown project: A coloring page for the kids! 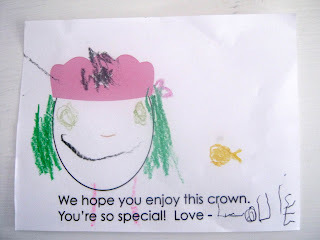 If you're making crowns (to send to me or give away on your own) - get your kids involved! I was having L color each child a whole picture, but after awhile she lost interest (49! you can imagine). So remembering the wild success of Inchmark's valentines, I created a similar template of a head and crown that she can doodle a face and hair and other goofy details onto (like a goldfish). There's also a note and a space for her to write her name (plus space to add a more personal note from the adults). I'm adding the link to the main Nicholas Crown page, but you can also download it here. 4. And I made a new twitter account to separate my craft tweets from my local tweets. So if you do twitter, join me @wewilsons.